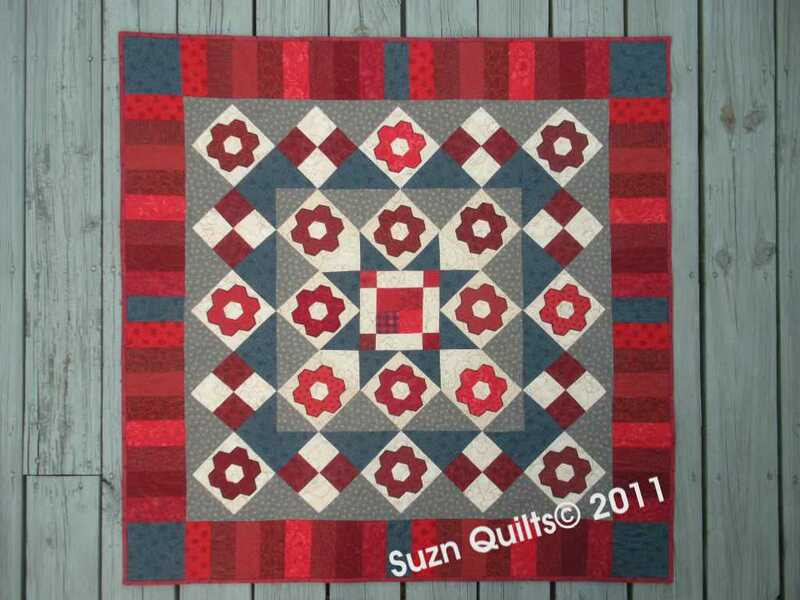 July | 2011 | Quilting my way through life! These days my “work brain” is all about Houston’s Fall Market the end of October. Deciding what to showcase at market is always a hard decision. After the decision is made, things always seem to go a bit smoother. Fall market is the time of year that shops are purchasing the items that they will supply their shops with in the new year. These items are things to take your mind off of the cold, dreary, wintry days. One of the things that can usually do this is sewing for spring. Today, after our guild meeting, I was thinking more “Amelia”! I know I already showed you a sneak peek of my newest creation last week that was also made with “Amelia”, but I decided that I wanted to make some of my “Charm Pack Garland” to hang in my booth too. 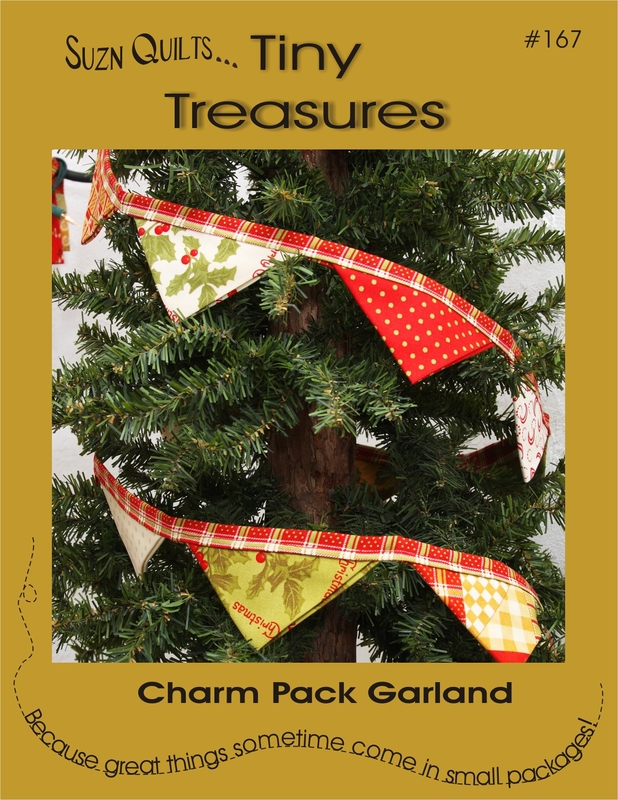 It’s one of my “Tiny Treasures” patterns, a fast & fun pattern that makes a cute garland for a Christmas tree, but it also can be made to hang anywhere, anytime. Don’t you just love it when things work out as planned? I’m working on a new quilt-as-you-go lap quilt design (remember my tutorial here?) for a new pattern and I have just two more strips to sew on and guess what? I have just enough batting & backing to sew them onto!!! Can’t ask for more than that, can I? 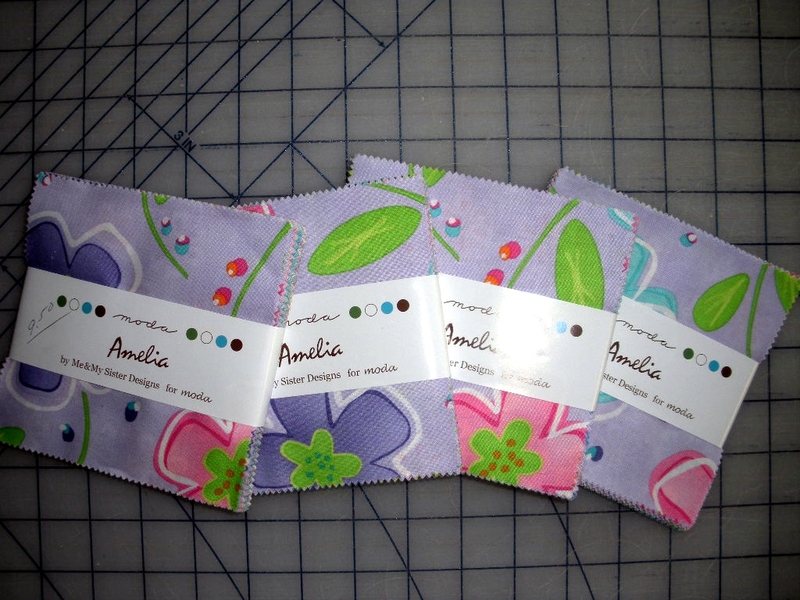 This is the new “Amelia” collection (plus a yellow dot that I just had to add) by Me & My Sister for Moda. And no I don’t mean Susan Marth & her sister, Lori. Although my sister was taught to sew by our mom too, she prefers to look at what I sew! She is however, my accountant and biggest cheerleader. According to Moda’s website, Amelia should be at your local quilt shop next month. Measure, measure, measure. Those are the three most important things to remember for my quilt-as-you-go technique! If you haven’t already tried one, maybe it’s time? Now, back to work. 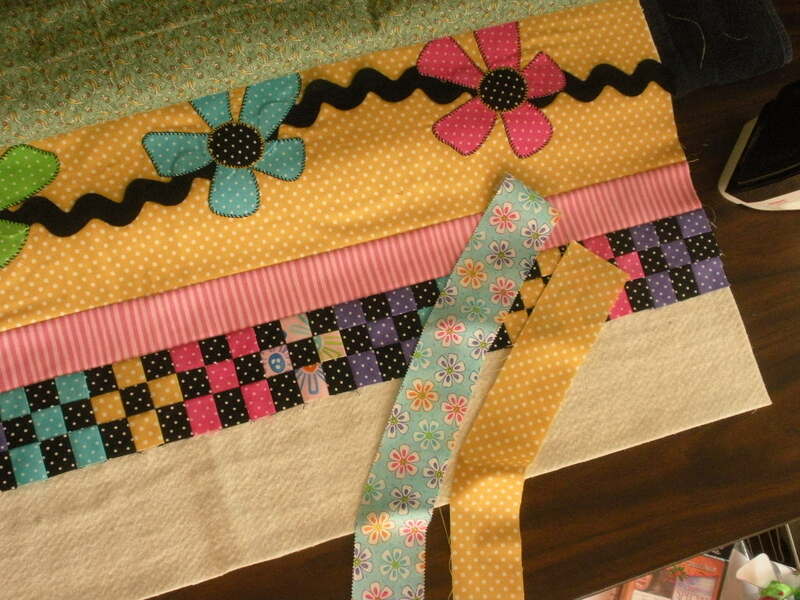 I need to sew the final two strips on, add the binding and stand back to view my latest creation. That’s my favorite part! It was fun to see the entries of our patriotic challenge, nine in all. We had a swap (well, most of us…I physically set up the swap and swapped the pieces for everyone but myself!) 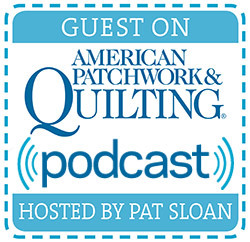 We then used those 24, 5″ cream squares, 24, 5″ blue squares, and 20, 2-1/2″ x 21″ red strips to make a quilt adding whatever we wanted to. The only stipulation for joining the challenge was that the quilt had to be completely finished. I’m always amazed at the vast difference in designs, sizes, and the talent! Everything from bed size, lap sizes, wall, table runner and miniature! We voted for our favorite and every entry got at least three votes. Lady Liberty by our president, Chris Prager, won first place. 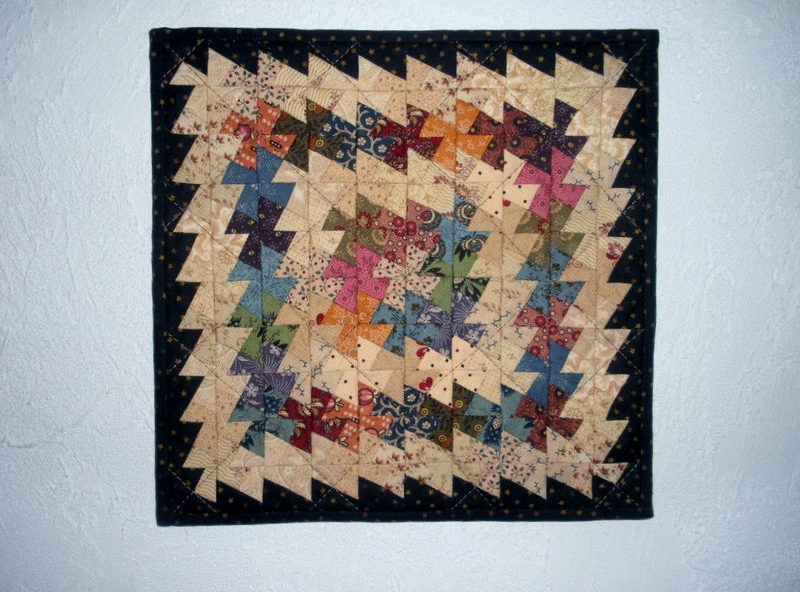 The small star quilt which was actually double-sided with the other side being a Tiny Twister quilt by Susanne Randall won second place. Third place was won by Denise Saksa, with the table runner. They each won a gift certificate to a local quilt shop. I hope you enjoyed the challenge too! Well, I worked on this most of the day after we got home from church. It coordinates pretty well with our deck, huh? I didn’t know how to quilt it until Chloe and I got it basted, we used Sullivan’s spray baste, then it just came to me. Once I’d decided, it didn’t take long to quilt. The binding went quickly too. It’s nice to be able to make decisions and have them come out looking the way they look in my head! then sewed the pieces into a top today. 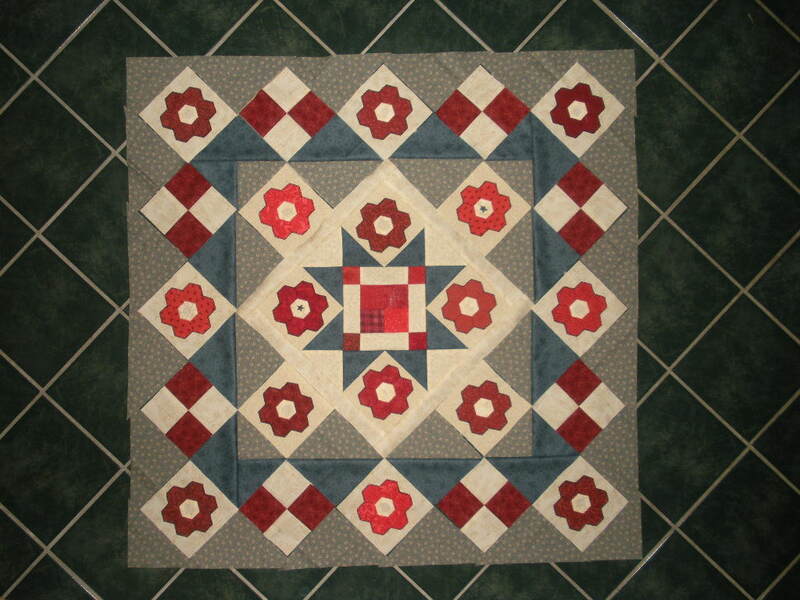 It looks better in person, like most quilts! This is my design floor. No walls in my sewing room big enough to devote to this, too many big, beautiful windows! I’m thinking a pieced red border at this point. What do you think? 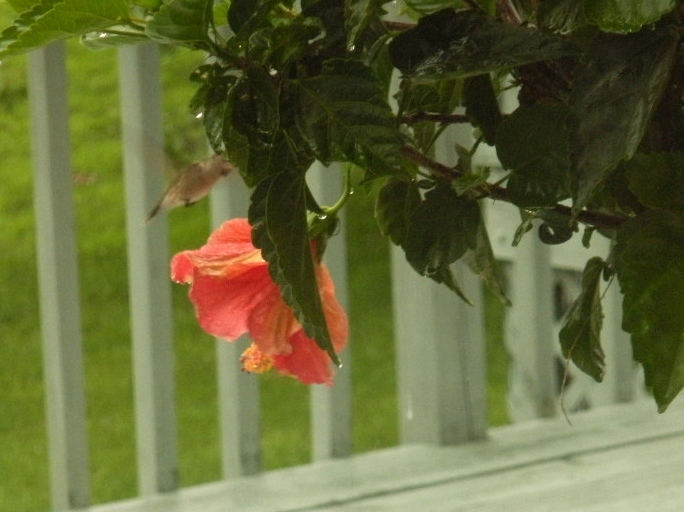 In case you can’t tell, it’s a hummingbird on my newly re-potted hibiscus tree! I was sitting at my kitchen table, eating yet another piece of my most favorite food in the world, Crispy Crust Pizza, and there he was. I kept eating and he didn’t go away, so I decided to go for my camera, and was able to get three photos of him before he flew off! And this is why we buy a new hibiscus and put it in the same spot every spring. This is also why David thought it necessary to buy this outrageously expensive beautiful pot! By the way, I also got a bunch more done on my patriotic challenge. I’ll show you more of that soon, but not tonight, we’re under yet another storm warning! Tornado in the area!